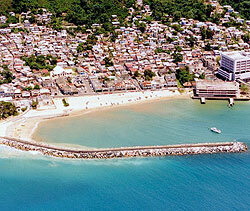 The municipality of Aguadilla is located in the northwestern tip of Puerto Rico. Its name is derived from the Indian word guadiya, meaning "garden". Aguadilla's claim to fame are its surfing beaches, the most notable of which are Crash Boat, Gas Chambers, Surfer's Beach, and Las Ruinas (also known as Wilderness Beach). Aguadilla has the one and only ice-skating facility in the Caribbean region. Locals and tourists skating on the ice in their swimsuits at the Aguadilla Ice Skating Arena is not an unusual sight. 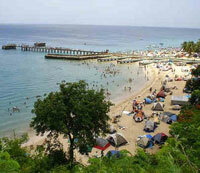 The largest aquatic theme park in Puerto Rico can also be found in Aguadilla. For those to love to go on historic walks, sites of interest are the Punta Borinquen Lighthouse, built in 1889 and now a preserved historic site by the National Register of Historic Places, and Christopher Columbus Park, which has a boardwalk for those romantic beach strolls. The Ojo de Agua is a plaza with a natural spring that was an underground source of fresh water during the Spanish occupation of Aquadilla Harbour. The former Ramey Air Force Base is now the site of several key facilities in Aguadilla, including the Rafael Hernandez International Airport and the Punta Borinquen Golf Course. Also in this location are a few schools, the most notable of which are the University of Puerto Rico-Aguadilla Campus, Friedrich Froebel Bilingual School and Centro de Adiestramiento y Bellas Artes, the only public school for the arts in Puerto Rico. Recently constructed on the site are the Ramey Skating Park and Mariposario, a butterfly farm. The newly opened The Courtyard by Marriott Punta Borinquen Resort and Casino is here. A thriving city with a wide variety of commercial and industrial business opportunities, Aguadilla has plans of upgrading its downtown area with underground power lines and the construction of a new expressway. Aguadilla Puebo is the administrative seat of the city of Aguadilla. The city is governed from the City Hall, more popularly known as the Alcaldia (Mayor's House). In front of the Alcaldia is Plaza de Recreo, the town centre where you can shop for handcrafted jewellery and souvenirs made by local craftsmen. A number of these souvenir shops can be found along Progreso Street. Because the Aguadilla Ice Skating Arena is located in this area, there are also a number of skate shops here. The historic underground fresh water source Ojo de Agua is a tourist attraction. There is an interesting story behind the name of Playa Crash Boat, or Crash Boat Beach. Years back, when the beach was still being used by the U.S. Air Force, it served as a pier for rescue boats that headed out when airplanes crash into the sea. Now, Crash Boat Beach is one of Puerto Rico's most picturesque locations, with its crystal-clear waters and colourful fishing boats. It is a popular spot for surfing, fishing, kayaking and snorkelling. A number of small businesses sell or rent out equipment for aquatic fun. The brand new residential condominium of Puerta del Mar is situated 300 feet above sea level, overlooking Crash Boat Beach. Even if you don't head down to the beach below for a swim or a dive, this Mediterranean-style condo offers a number of recreational facilities for the whole family, all which provides spectacular views of the sunset, Aguadilla Bay, Desecheo Island and Mona Passage.